of our William Adams Hickman. Martha Diana Case Howland Rodgers Hickman was born October 8, 1825 in Troy, Bradford County, Pennsylvania, daughter of Moses and Rachael Case. Being of a weak and frail constitution she had a fair education. At the age of fifteen years she taught district school summers, in the winter sessions she attended school and cultivated her mind to be better prepared for summer work. In her eighteenth year she became acquainted with a gentleman by the name of Henry Howland; as they became better acquainted their friendship grew to love. They were married December 27, 1842. They took up a quarter section of land in Flagtown, Ogle County, Illinois. Through industry and economy they made a good home. Their eldest son, Henry, was born September 27, 1843. Helen Rachel was born in Flagtown, Ogle County, Illinois, April 24, 1846; Emma Jane was born in Flagtown, January 14, 1849; Martha was born in Flagtown, December 18, 1851. Their son Henry died in his fifth year with the croup (1848) at Flagtown, Illinois. While living in the State of Illinois they became acquainted with an old lady--she went by the name of Grandma Lenord; she belonged to a different religious faith than any they had ever heard of before. It aroused curiosity in them, she said she would lend them her books of the church if they would be very careful with them and return them after reading them, as she prized her books very much. One of these books was the Book of Mormon. Martha read the book in the day, and in the evening would read it over again to her husband when his day's labor was over. They began to think and converse about the Book of Mormon and say it might be possible that it was true. The more they read and thought about the matter, the more convinced they were of its truth. They invited Grandma Lenord to come and make them a visit. She came and became so attached to Henry and Martha that she made her home with them and taught the Gospel so plain that everyone could not help but see how true it was. Martha was anxious to see her parents, brothers and sisters, and relatives to explain the Gospel to them. It was not long until she and Henry started out to make them a visit and make them acquainted with their new faith. But oh, how disappointed they were; not one could see the Gospel as they did. They thought poor Martha had gone crazy with her bad health. How bad Martha felt to think they could not see the Gospel in its plainness as she did. Her faith was not shaken in the least, she and her husband returned home. It was not long until the spirit of gathering began to be the foremost thoughts in their minds. It was a long tedious journey to make those days with teams across the plains to Salt Lake City, but they must gather with the Saints. They would often talk the matter over and ask if it was wise and prudent to take such a journey. Martha was of a courageous disposition; she felt like trying such a journey and thought her health would improve. So they began to make preparations for the journey. Henry could find no one able to buy his place so he rented it for five years, but as it was not sold, Martha always counted it as a sacrifice. They bought what comforts they would need and ten dollars worth of medicine for the trip. They started for Salt Lake City in the Spring of 1852 taking glass and nails to build them a home when they arrived in Utah. Grandma Lenord, still being one of the family, journeyed with them. When they arrived at the Missouri River, they found a company of Latter-day Saints making preparations to go to Utah. Henry took his blacksmith tools and helped them make ready to move on. All things being ready, they started in the fore part of June 1852. Henry worked very hard to help the Saints across the river. The cholera broke out in the company and a great many lost their lives, thirty-two in number. Among the number, Henry, one of the best husbands, laid down his life on the 13th of June 1852. Oh, what a sad time for Martha, a sickly woman with her three little girls, the oldest six years old, among strangers, as it were, for she had only made their acquaintance a few days earlier. Grandma Lenord was with her, but little did Martha know how soon she would be taken away from her. It was so sickly where they were that Captain John Tidwell thought it best to take Henry a few miles up on a hill to bury him where they would have pure air as there were so many deaths. The captain urged Martha to get out of her wagon with her three little ones and get in another one, he also urged Grandma. Martha obeyed the request, but Grandma would not, but stayed with Henry. Through the excitement of the moment the team, which was not harnessed right and being a young team, ran away with the corpse and Grandma Lenord in the wagon. She was thrown out and killed. Henry and Grandma were buried in the same grave on the banks of the Missouri River. It was several hours before Martha was aware of the sad accident. She fainted when the team started to run and it was hours before she came to herself enough to realize her situation. How lonely and sad were those days to Martha. She had many good friends rise up to try and cheer her poor lonely heart. Martha and Henry had intended to be baptized at the next suitable place. Martha said she did not feel like faltering but going on to the mountains with the Saints. She was baptized June 20, 1852 by John Tidwell. Martha stood the journey very well. The Lord strengthened her both in body and mind. They arrived in the fall with the company of Saints in the Valley of the Great Salt Lake. She bought a house and lot in the Second Ward, Salt Lake City. She married a man in the year 1853, by the name of Telemachus Rodgers. It was not a happy union; they lived together one year and then separated. A daughter was born July 31, 1854. They named her Henrietta Louisa. Martha taught school and did many kinds of fancy work to maintain herself and family. Martha being of generous disposition was always ready and willing to help the poor and needy. While a widow, she took a poor blind woman and fed and waited on her as one of the family one year. During the grasshopper war of 1854, she shared her last loaf of bread with a poor woman that came hungry to the door while Martha and the children were eating their last loaf of bread. Nearly fifty years have passed since that time and still that scene is imprinted so strongly on her daughter Helen's mind that it seems only yesterday. Martha invited the lady in and had her sit down at the table where they were eating their dinner. She was a Scandinavian and could not speak the English language, but she asked the blessing on the food that the widow had shared with her, and the tears rolled down her cheeks. She ate her dinner and when she left she kissed Martha and her orphan children and asked the blessings of the Lord upon them. In about two hours, a Brother Tanner brought Martha two hundred pounds of flour which carried her through until other ways were provided for, and Martha and children never went without bread. Martha was a peacemaker and many came to her for cousel and would lay their heartaches at her feet and always go away feeling better, as she would always give them good advice and have them go to the Lord in prayer with faith that their hearts might be able to bear their burdens without complaining, as there is a brighter day ahead. While teaching school in the Fourth Ward, Salt Lake City, she became acquainted with William A. Hickman, a man who was well thought of at that time in the Church, but who afterwards apostatized. Martha and Mr. Hickman were married in the year 1855. He was kind and treated Martha's children as his own, never was cross or unkind to them. Martha's home in Salt Lake City was sold and she went to live in West Jordan. 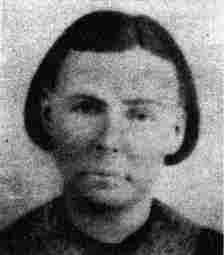 Martha taught school, moved south at the time of Johnston's Army and taught school under a large tree at Pond Town, Utah. A number of scholars besides the family came to school. They had a good time even if it was camp life. Martha had four children born through this marriage, two sons and two daughters. She was a firm believer in Celestial Marriage, but never went back on her dead husband, Henry. She did not have the privilege of being sealed to him before her death as there was not a house on earth for that purpose at that time, but her last words were to have Henry's work done. In the year of 1860, the 4th of April, her eldest daughter, Helen, married a man by the name of Nephi Packer and moved to Brigham City, Box Elder County, Utah. In the spring of 1861, Martha went to make her a visit; she stayed through the summer and taught school at Willard City, Utah. In the fall Martha went back to West Jordan, but she could see that something was the matter with Mr. Hickman: he was not living his religion as he used to and it made Martha very unhappy. What to do she did not know. She prayed to her Heavenly Father to open the way that she could get away with her children so that they would not partake of the influence of the company that was thrown around them. She would coax and beg Mr. Hickman to let her go and teach school, but he would not listen. In the fall of 1862, Nephi and Helen came to make her a visit and stayed through the winter. In the spring Martha went home with them. As Helen was not well, Mr. Hickman consented for her mother to go home with her, but he would not consent to have her take all of the children, she only took two. Nephi had moved to Franklin, Oneida County, Idaho during that time. Mr. Hickman came up with a company of soldiers going to Soda Springs. Martha begged so hard for her children to come and stay until Helen's health was better that he gave his consent. What a happy mother, and how thankful Martha was. It was not many months until Nephi went and got the other children. In those days all travel was by team; they did not have railroads as we have them now. Little did Mr. Hickman think Martha was not going to come back home again. He would write for her to come home, but she would make some excuse or another. She taught school and she and Helen made gloves. They would card, spin, and make cloth, knit socks, mittens, hoods, and do all they could to make an honest living. Her three daughters were old enough to help do the housework and help with the children. Nephi, the dear soul, never complained of such a large family. All went smoothly, all worked to one another's interest. Emma, her second daughter, married a man by the name of Nephi Comish, January 1865, in Salt Lake City. They made a home in Franklin, Idaho. Emma's husband died and left her a widow with nine children. Nephi and Helen moved to Brigham City, Utah. Martha felt lonely when they were gone for she had made her home with them for so long. They wished her to go with them, but she thought it better to stay at Franklin as she thought she could get employment for her and her children where she was better acquainted. It was not long until she had means enough to buy a piece of land and had a log house built on it. She raised enough to keep herself and children on the ground, with what means she could make with her needle as she could do all kinds of needle work. Martha's third daughter married a man by the name of Isaac Bartlett Nash, November 8, 1867, Salt Lake City, Utah. They made their home at Franklin, Idaho. They were the parents of twelve children. Martha perished in the flames at Valley Ford, California, November 21, 1916. She was buried in the Franklin Cemetery, Idaho, by the side of her husband and children, also her sister. Martha's youngest child died July 12, 1866, her name was Mary Rosina. This sad bereavement left Martha very lonely. Nephi and Helen being on a visit to see her mother took her home with them to stay a few months. Martha had made ready three times to go back east to her old home to sell the old homestead that Henry and she had left unsold when they came to Utah, but she failed each time to go. The first time, Emma had a relapse from the measles and was sick for a year. The second time, she was sick herself. The third, she came as far as Brigham City and Helen persuaded her not to go as she felt her mother was not able to make the journey, as her health was failing very fast. Helen said they had all lived these many years without the money and they could do so longer. Martha's lawyer being dead and the deeds burned in the flames when Martha's house burned while she was teaching at Willard City, Utah, destroying everything, it was necessary for Martha to go and attend to the business herself or not get the money at all. But they all preferred to live without the money than to have their dear mother go and lose her life far away from home. And it will be counted as a sacrifice, which was a great one--for Martha was reared a lady and did not know what hard work was or the trials and troubles of life until she buried her dear Henry. Oh, the bitter tears she shed after that, but she was always true and faithful to God and the truths of the Gospel and never spoke lightly of those in authority. She had her washings and annointings done in the Old Endowment House, Salt Lake City. She was a member of the Relief Society of Franklin, Oneida County, Idaho. I have been told that the buckskin gloves she made were beautiful. Being an expert with the needle, she embroidered the cuffs or gauntlets so they sold readily. Her ambition was greater than her strength, her health failed, but she still taught school and although confined to her bed she would hear her classes, and after school and a rest she would sew, making many gloves by candle light. Not having the proper help she gradually grew weaker, and on March 16, 1872, she joined her first husband in the great beyond. She was the mother of nine children. This is a brief sketch of the life of one of the daughters of Israel, the only one of her father's family, the poor little frail girl whose life was despaired of many times. Her posterity at the time of this writing, July 3, 1902, overruns one hundred souls and it will be through them that her father's family will be brought into the folds of our Savior. Martha's grandsons have taken missions to warn the people and preach to them the true Gospel, and others will be called. Her children and grandchildren hold many responsible positions in the Church of Jesus Christ of Latter-day Saints and it is the sincere wish of the writer that all will be found faithful to the end. To learn more about William A. Hickman, click here. To learn about Bill Hickman's other wives, click here.